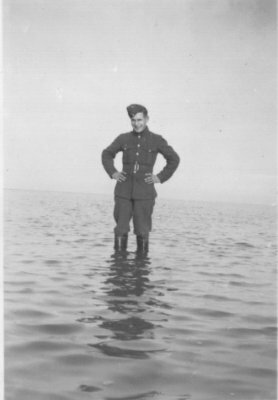 For 7 weeks, from 23rd October to 9th December, 1937, Harold found himself on the rather bleak, and at that time of the year desolate, location of No.2 Armament Training Camp at the quaintly named North Coates Fitties, on the coast of Lincolnshire, just south of the Humber Estuary. In 1935, the RAF had only three such Camps. Besides North Coates, there was one at Catfoss, in the East Riding of Yorkshire, and one at Sutton Bridge near Wisbech, in Cambridgeshire. Under the 1936 expansion scheme, nine more such Camps were established, including No.4 at West Freugh in Scotland, and No.6 at Warmwell in Dorset. 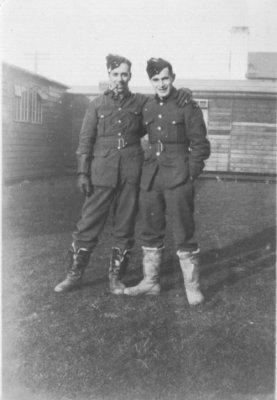 When Harold arrived at North Coates the establishment was still referred to as an Air Observor School, but during his stay, on 1st November to be precise, a major administrative change occurred, although it was unlikely to have had much effect on the ordinary airmen attending the training camp. On that date, the Station Headquarters and Air Observors School were merged to become No.2 Air Armament School, and S/Ldr J. Marsden was posted as Commander of the Temporary Armament Training Camp. In April 1939, these schools underwent another name change when they became Armament Training Stations. The purpose of the schools was to train pilots and aircrew in bombing and gunnery, and as such they were located in places where, as 'Flight' Magazine put it at the time 'bombs could be dropped and machine guns fired without risk to the persons of the King's lieges'. As with similar present day schemes, protests were raised by societies intent on keeping the camps away from their locality. Normally two squadrons would be based at the Camp at a time, usually for about a month. As well as training airmen engaged in active flying, the AAS's were also involved with the RAF's scheme whereby ground personnel would be taught the basics of air gunnery, so that in the event of a war, navigators could quickly become pilots, and their roles be taken over by the trained Part Time Air Gunners. Hence the reason for Harold's stay at North Coates. The camp had hutted accommodation (Harold lived in Hut No.23), and included sleeping quarters, messes, a hospital and a N.A.A.F.I. As Harold himself said in a letter written from the camp to his sister, the latter organisation provided free shows, as well as food, drink, and other 'groceries'. He also pointed out how cold Lincolnshire was at that time of year, but by stoking up the hut stove in the evening, it could be kept going all night. Gunnery training consisted of two main practices - air to ground and air to air. The ground targets were mainly located along the shore, over which the RAF had rights to some seven and a half miles, extending about 8,000 yards out to sea. These targets consisted of old aeroplane fabric stretched over a framework, each with a large Roman numeral indicating the target number. The aircraft used were often the Station's own, Gordons and Tiger Moths. Air to air firing was at flags or drogues towed by one of the station aircraft, generally on a cable some 1,000 feet long. After the flag target had been fired at, the towing aircraft dropped it to the ground, and then released a drogue type without having to land. This target resembled a wind-sock, and was the same size as the fuselage of a Bristol 'Bulldog' fighter. In order to make the most use of a drogue, the bullets fired at it during different practices were smeared with different coloured paint, which left distinguishing marks around the holes caused during each practice. After various 'attacks' the drogue was also dropped to the ground for marking. Under normal conditions, firing was carried out between ranges of 100 and 300 yards. 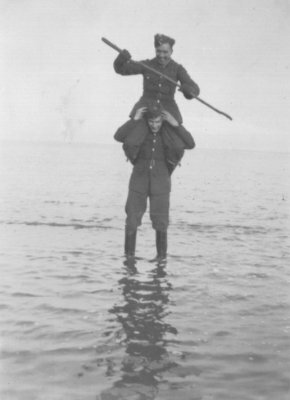 Harold successfully completed his course at No.2 AAS, and returned to the routine of his Squadron with the added title 'Air Gunner Part Time'.